PLEASE HELP keeping an eye out for my fur baby. 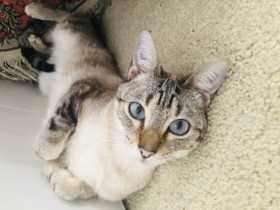 1 year 11 month old Siamese/ Lynx- Blue eyes. He has never been outside unsupervised and escaped out of his harness leash on March 29, 2019 and has been missing for 72 hours. The neighborhood is Crimson Canyon. He is microchipped but unable to fend for himself. He is gentle and loving but easily scared at this point I’m sure. If found contact me at 7139660987 or Bianca.schoeffling@gmail.com Thank you!